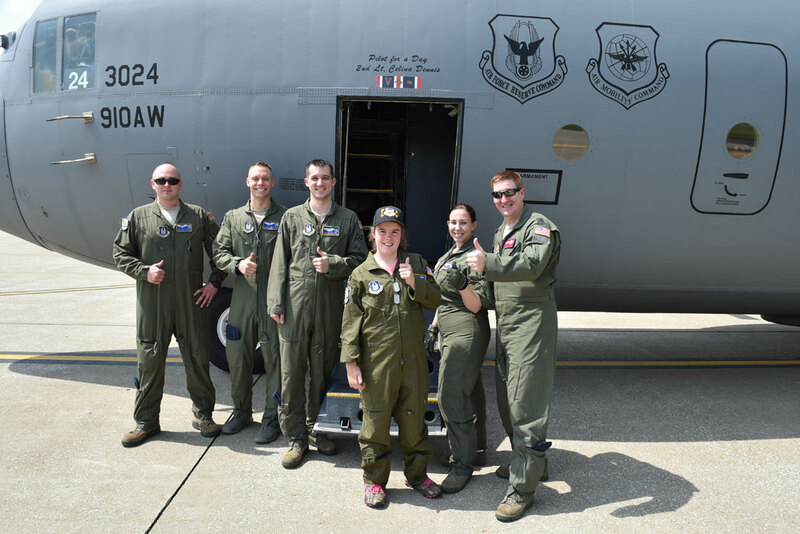 You can’t blame Celina Dennis for having a hard time pinpointing the best part of her “Pilot for a Day” experience at the Youngstown Air Reserve Station this week. It was taxiing on the runway in the cockpit of a C-130H Hercules aircraft. It was spraying the hose with the air base fire department. It was wearing a custom-outfitted flight suit. It was seeing her name on the airplane. Celina was treated to the experience through a partnership between Akron Children’s Hospital Mahoning Valley and the YARS Base Community Council. Since June 2000, the Pilot for a Day program has given more than 60 children with chronic or life-threatening illnesses an opportunity to meet Reservists and receive a VIP, behind-the-scenes air base experience. The 12-year-old 6th grader at Poland McKinley Elementary School has hydrocephalus, a mild form of cerebral palsy, and is treated by neurologists, neurosurgeons and orthopedic surgeons at Akron Children’s. She was born 3 months premature weighing 1 lb., 11 oz., and had a VP shunt implanted at birth to treat excess fluid that collects in her brain. Despite her chronic condition, Celina doesn’t let it get her down. She plays the trumpet in the school band, is a whiz on her iPhone and enjoys going camping. 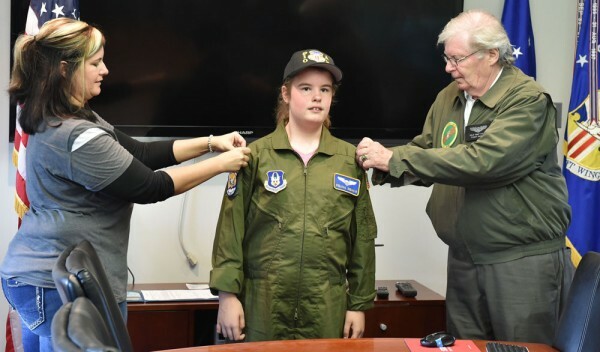 She also, coincidentally, visits air bases with her grandfather, Dale Pullium, an Air Force veteran who served in Vietnam and joined Celina on the Youngstown Air Base tour, along with grandmother Chris Pullium. As part of the tour, Celina was provided a full military flight suit and commissioned as an honorary Air Force Reserve 2nd lieutenant. She also received a model C-130 plane and tag, both with her name inscribed, and saw demonstrations about parachutes, night-vision goggles and other pieces of equipment. She also ate lunch with Reservists, her family and hospital representative Kay Barto, a cast tech in the office of pediatric orthopedic surgeon Sheryl Handler-Matasar.